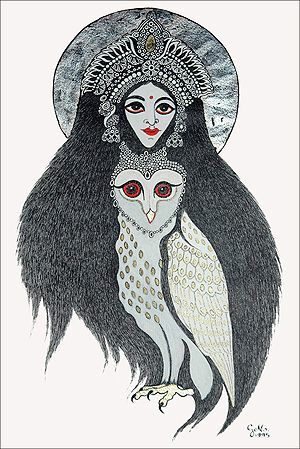 In Orissa and Bengal, Lakshmi images include a white owl. In local belief, white owls have come to be associated with auspiciousness and good luck because of their association with the goddess. Who is this owl? Scriptures do not clarify. Some say, Lakshmi rides the owl; others believe the owl simply accompanies her, while she rides on a elephant, the latter being a more appropriate vehicle for the goddess who is associated with wealth, power, and royal splendour.